Before our volunteers leave, we have a book where they can write a note to future volunteers telling about their experience working and living at Hacienda Tranquila. Whether about working on our projects, enjoying life in the community, or cooking meals in our new oven, the stories reveal what life will be like in the Galápagos Islands. Those notes are always so valuable, and we appreciate the thoughtful words our volunteers contribute. I can remember each time I have looked through that book and thought about how exciting everyone's adventure must have been! Just another day in the life of a volunteer: making pizza for lunch. Since the number of people coming to view this blog seems to be growing, we've decided to try out a fun, new project. It's special because we want to involve all of our past volunteers out there who have a knack for storytelling or writing, and want to have their words put up here on our blog! So, here's how it will work. Send us a funny, interesting, or exciting story about your experience at Hacienda Tranquila and any pictures that might go along with it. These stories don't have be long, so go ahead and start typing! 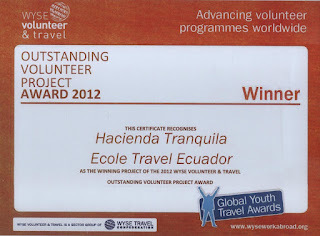 Please send them to us at haciendatranquila.galapagos@gmail.com by April 13, 2012. After we have all of the submissions, we'll pick a few to put up on our blog. Your words will be here for everyone to see and share in your experience! Plus, imagine how helpful your insight can be to those out there that are interested in volunteering at the Hacienda! We know our friends across the globe have some great stories to tell. Loved lounging on those hammocks? Tell us about it! Let me start by saying I would not consider myself "outdoorsy". Ask me to go camping? I might say yes. Ask me to hike the Inca trail to Machu Picchu? I will take the train, thank you very much. But as a city girl living in the Galápagos and interning at Hacienda Tranquila, I was far from my familiar surroundings. I was smack-dab in the middle of the highlands of San Cristóbal. I had limited outdoor experience, so when Geovanny asked me to help another staff member repair a fence one of my first days, I gave him a look of absolute terror. I really wanted to impress my new boss though, so with a machete in one hand and a bucket of water in the other, I set off trailing Carlos with the determination to try something new. We needed to cut some branches down for the posts, so Carlos showed me a good one to work on and I started hacking away. Needless to say, in the time it took me to cut down one, Carlos managed to cut four! I tried as hard as I could though, and had a lot of fun in the process. That was only the beginning of my experience at the Hacienda, and before long, was doing things I never thought I could possibly do. Now, I can easily identify the endemic species we are growing here and wield a machete like the best of them! Those unique and powerful experiences would develop a passion deep within my soul for the plants and people of the tiny island of San Cristóbal and the Galápagos archipelago. So friends of Hacienda Tranquila, that's not too hard, right? What story do you have to tell?! With its crystal blue waters and exotic species, the Galápagos Islands are a unique destination to visit for any travel enthusiast. Yet, because of an increase in tourism over the past thirty years, noticeable long-term impacts on the fauna and flora have taken place, as well as a vast amount of harmful carbon dioxide gas released into the atmosphere with the travel to and from the mainland. Although tourism brings economic benefits to the island and serves as a driver for sustainable development, the inclusion of environmental return is necessary to ensure the sustainability of the Galápagos' ecosystems. Playa Mann, a popular beach for tourists on San Cristóbal. Carbon sequestration can be understood as the process of capturing carbon dioxide from the atmosphere by plants, trees, and crops through photosynthesis, which is then stored as carbon in tree trunks, branches, and the soil. Research has shown that sequestration activities offer cost-effective emission reduction opportunities, as well as generating environmental co-benefits. Hacienda Tranquila has already begun giving back to the island by planting 750 Manzanillo and Matazarno trees that capture a large amount of carbon dioxide from the atmosphere. 250 of these are Manzanillo, which capture 750 kilograms per year, and 500 are Matazarno, which capture 148 kilograms per year. All of these combined, we make a significant impact on the sequestration of carbon by capturing 191 tons from the atmosphere per year. 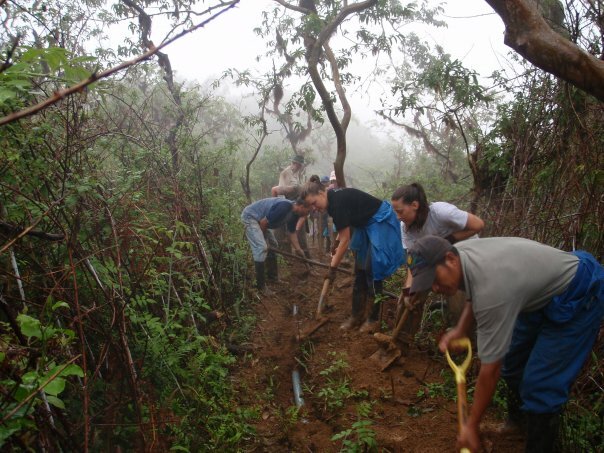 To further address the issue of tourism and its effect on San Cristóbal, our staff and volunteers are helping to develop the largest carbon sequestration garden in the Galápagos Islands. The garden itself will feature both Manzanillo and Matazarno trees, both of which are endemic species to the island. Our garden will be placed within a 15,000 square meter area on the Hacienda's grounds. A wide view of the area where we plan to develop the garden. We began this project in March of 2011, and have cleared close to 10,000 square meters in the area so far. After we successfully clear all of the invasive species, we will increase the number of endemic species by planting 7,000 Manzanillo and Matazarno trees to create the garden. We believe the garden itself will serve as an example for all who visit the island on how communities can positively impact the environment. Our goal is to work on the garden over the next three years, reaching completion in 2015. Matazarno trees ready for planting on the Hancienda. Volunteers are hard at work helping us to clear the area we have set aside for the garden. We'll be keeping all of our supports updated on this project, so check back for updates in the future!